Reputable and professional providers of screen printed T shirts such as Tagless Threads, are able to offer screen printing to exacting standards and generally offer larger then normal printing sizes, in fact Tagless Threads are able to offer a size of 15" width by 17"in height. In addition they make use of automated machines that are able to print bulk quantities to accurate dimensions and are highly efficient in the process. The company offer a minimum order of only 48, with a maximum number of ink colours of 7 and a variety of sizes are available. Tagless Threads was born on the idea to change the world one T-shirt at a time. Seriously. 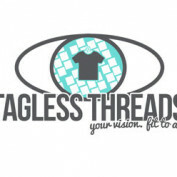 Tagless Threads is on Facebook!